With its parks, museums, and the palace of Sanssouci, the UNESCO World Heritage Site of Potsdam is a perfect day trip from Berlin—it's just 15 miles (24 kilometers) from the German capital, on the Havel River. Here are a few ways to experience the area. Whether it's on foot, by bike, or via coach, a guided group tour of Potsdam is an excellent way to maximize your time in Brandenburg's capital city. Here in the "Versailles of Germany," you can explore fairy-tale landscapes; wander through the rococo palace of Sanssouci (meaning "carefree" in French) where the Prussian kings came to relax; and enjoy lunch at an authentic beer garden on a half- or full-day guided day trip from Berlin. A private tour gives you the benefit of a flexible itinerary, with time to visit the sites you'd most like to see. Your tour guide can offer tips tips on the best places to eat, drink, and shop in Potsdam's old city, and you'll have their undivided attention throughout the day. Whether you opt for a full day away from Berlin or a half-day tour, a customizable private tour is a great option for groups or families with kids. Potsdam is set just 15 miles (24 kilometers) west of Berlin, a journey of 25 minutes by train or 40 minutes by road. Be sure to bring your camera, comfortable walking shoes, and water and snacks for the journey. Most tours include round-trip transportation. Discover the city of Potsdam, once home to Prussian kings and the German Kaiser, on a 6-hour walking tour from Berlin. See how royalty left its mark on the city's streets as you wander past Cecilienhof Palace, King Frederick William II’s Marble Palace, the Dutch quarter, and the UNESCO-listed Sanssouci Palace and Gardens. Stop for lunch (own expense) in the city center, learn the regal history behind each site that you pass, and return to your original departure point in Berlin when your tour concludes. Get to know the best of Potsdam on a guided, 4.5-hour bike tour around this scenic university town. Discover its beautiful palaces, parks and gardens. See the historical city center and Dutch Quarter. Pedal past the royal residences of Sansoucci Palace, one of the largest UNESCO World Heritage sites in Germany. Visit Cecilenhof Palace, where Churchill, Truman and Stalin wrote world history, then stop at a beer garden for lunch (own expense). A train ticket plus the use of a bike and helmet is included. Explore Potsdam’s elegant gardens and palaces on a 6-hour, private tour from Berlin with an experienced guide. Enjoy the flexibility of a private tour, with time to visit the sites that interest you most. See the Glienicke ‘bridge of spies’ and a palace that housed WWI peace conferences, then stroll the manicured park that surrounds Sanssouci Palace, a UNESCO World Heritage Site. Enjoy tips on the best places to eat in Potsdam’s old city, with plenty of time to browse cafes, boutiques and a local market before returning to Berlin. 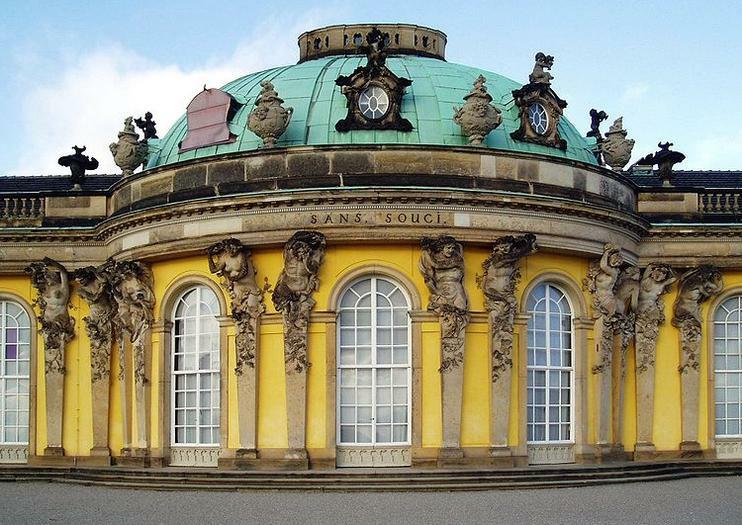 Get to know the best of Potsdam on this private, guided, 7-hour trip from Berlin. Discover its beautiful palaces, parks and gardens. Learn how this scenic town served as the residence of Prussian kings and German emperors for three centuries. See the historical city center and Dutch Quarter. Travel past the royal residences of Sansoucci Palace, one of the largest UNESCO World Heritage sites in Germany. Visit Cecilenhof Palace, where Churchill, Truman and Stalin wrote world history and stop in downtown Potsdam for lunch (own expense). Berlin hotel pickup/drop-off included.